All windows allow the transfer of heat between the inside and outside of your home. Older windows allow more transfer to occur. This means that winter heat can more easily escape your home, as can summer cool; your heating and air system has to work harder to make up for the loss. Newer windows allow less transfer to occur; your heating and air system gets more rest – and costs you less money. In inefficient windows, heat is transferred too easily through both the window’s frame and its glass. If a frame is built from a material with good insulating (or poor heat transferring) qualities, it will be more efficient. Wood is an excellent insulator; vinyl and composites like Renewal by Andersen’s Fibrex are also effective. Metal windows frames are poor insulators. Newer windows often have two or even three layers of glass; in between the glass panes is another layer of gas. Some gases are effective insulators as well; krypton and argon are two often-used examples. In modern windows, even glass isn’t what it used to be. Today’s glass employs special coatings that can reflect away light rays or trap heat or both. The glass used for windows varies depending on the local climate, on the amount of sunlight that hits the window, and on the room inside the window. For example, if one room is especially prone to becoming hot or cold, the right window glass can help manage the issue. Richmond Window, my local Renewal by Andersen dealer, was very helpful in selecting the best windows for every place on my home. Maybe you’re wondering: How do you know which windows are right for you? Start with a basic understanding of the most common values used to compare window efficiency, U-factor and solar heat gain coefficient (or SHGC). The U-factor reflects to the heat transferring quality of the glass; lower U-factors indicate less heat transfer. SHGC reflects the amount of sunlight that penetrates into the house through the panes. Here in Central Virginia, we live in what’s called the North-Central Climate Zone. Here, we have to deal with both cold winters and hot summers. Thankfully, there are windows that are specially designed to perform well in our climate zone. In our climate, windows need to offer a U-factor of 0.30 or less as well as an SHGC of 0.40 or less in order to qualify for ENERGY STAR certification. 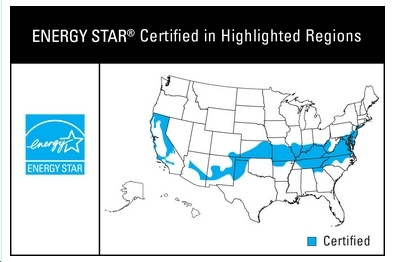 Make sure that your replacement windows should meet the ENERGY STAR requirements for your area. Chances are, you spend thousands of dollars each year to heat and cool your home. Replacement windows offer you the chance to spend a lot less. So perform your due diligence, get to know windows and their ratings, and make a smart choice that your benefit you for years to come.